Proceeds go to permanent endowments to provide continuing funding for our program of work. 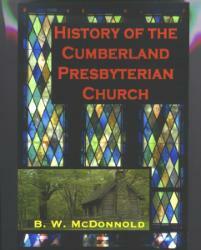 B. W. McDonnold's History of the Cumberland Presbyterian Church, originally published in 1888, has long been one of the most cherished and sought after books about the Cumberland Presbyterian Church. There were four editions of the book including the original but an unknown number of printings. As far as has yet been determined all of the original editions are textually identical for all practical purposes. These printings kept the title in print from 1888 until about 1942 at which time original supplies ran out and the book was not reprinted. It is likely that the final copies sold were part of the 1899 fourth edition but from a printing made after 1910. With no more "new" copies available for sale, existing copies of "McDonnold," as it had become reverently known, became heirlooms, handed down in families from generation to generation. On the rare occasion that sound copies entered the used and collectible book marker it was not uncommon for them to command prices of $100 or more. For many years we have wanted to make a relatively inexpensive edition available. The occasion of the 200th anniversary of the Cumberland Presbyterian Church seemed ideal for this dream to be fulfilled. The book you hold in your hands was reproduced from the fourth edition as it originally appeared in 1899. The decision to reproduce the book from an extant copy was not arrived at lightly. We hoped the entire text could be reset and properly indexed this turned out to be a labor intensive process that would have pushed publication past the 180th meeting of General Assembly in Dickson, Tennessee. We hope that this version will satisfy demand. By Rose Mary Magrill. (Marshall, Texas and Memphis, Tennessee: Sesquicentennial Committee [Cumberland Presbyterian Church of Marshall] and Historical Foundation of the Cumberland Presbyterian Church, 1998. Hardbound. 768 pages. This new resource is extensively researched and generously illustrated. 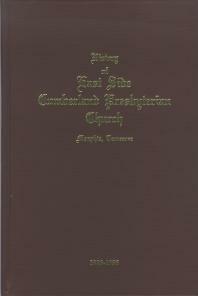 It contains information on early East Texas pioneer families who settled in Harrison County, Texas. In 1998 Family of Faith received Honorable Mention for the Robert Lee Stowe Award given for the best published historical study of an American Presbyterian or Reformed congregation. This award is given by the Presbyterian Historical Society. 1980 softcover reprint. 130 pages. 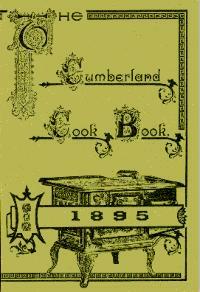 Four hundred tested recipes of Tennessee cookery compiled by the ladies of the Educational Circle of the Cumberland Presbyterian Churches of Nashville, Tennessee. A fascinating collection of 1890s recipes including everything from plum cordials to bed bug poison. 18" x 25" print on cream colored antique finish paper in brown duo-tone. 1981. 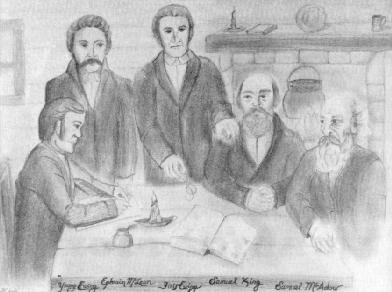 Print of an original sketch by Jon and Maritza Sparks of the people involved in organizing the new Cumberland Presbytery on February 4, 1810. Reprint of an undated engraving originally printed at Memphis, Tennessee. Adopted 1883, revised 1983, printed 1985. By Morris Pepper. Softbound. 135 pages. During nearly 60 years of ministry, Morris Pepper took the measurement of the Church of Jesus Christ--particularly that part of it inhabited by Cumberland Presbyterians. 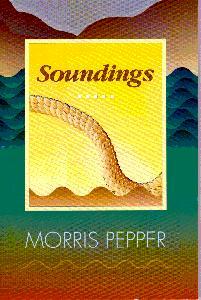 From January 1, 1981 to June 1, 1989, Pepper shared those insights with readers of "Soundings," a twice monthly column in The Cumberland Presbyterian. This book is an abridged compilation of those articles. By Ewell K. Reagin. Softbound. 2006 Reprint of the 6th edition. 97 pages. This book was originally published in 1931. 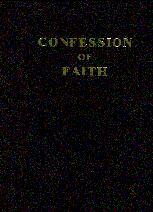 The author presents a simple interpretation of the chief doctrines upon which the faith of our denomination is based. The Life and Times of Rev. 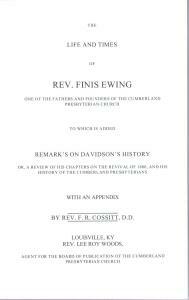 Finis Ewing: One of the Fathers and Founders of the Cumberland Presbyterian Church. To Which is Added Remark's on Davidson's History or, A Review of his Chapters on the Revival of 1800, and his History of the Cumberland Presbyterians. With An Appendix. By Rev. F. R. Cossitt. Softbound. 2005 Reprint of the 1853 book. 238 pages. 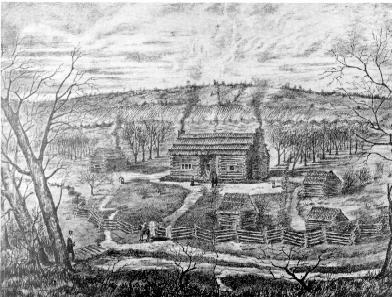 Cumberland Presbyterians have long been called Arminians. Irby explains and examines the actual differences. New for 2006! Trade Paperback, 174 pages, $10.95. 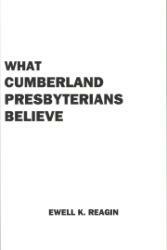 In this, the newest volume in Dr. Irby's Life and Thought series, the Memphis Theological Seminary Professor Emeritus of Theology turns his attention to the pivotal figure in the formation of the Cumberland Presbyterian Church. An excellent companion volume to Franceway Cossitt's Life and Times of Finis Ewing. Bird is generally credited with keeping the Cumberland Presbyterian Church together during the Civil War and with mending the wounds in the church after the war. Examines the theology of this prominent church leader. Former noted Memphis Theological Seminary theology professor turns his gaze to this 19th century church leader. New for June 2004! Irby continues his Life and Thought series with this volume about the controversial professor of systematic theology at Cumberland University from 1893 to 1906. A good measure of the controversy around Foster can be attributed to one thing, he went into the union with the PCUSA in 1906. The original printing of this book sold out quickly in 1997. King's Press, 2003. Hardcover, 764 pages.